Cross-sectoral, multidisciplinary partnership research is considered one of the most effective means of facilitating research-informed policy and practice, particularly for addressing complex problems such as chronic disease. Successful research partnerships tend to be underpinned by a range of features that enable knowledge mobilisation (KMb), seeking to connect academic researchers with decision-makers and practitioners to improve the nature, quality and use of research. This paper contributes to the growing discourse on partnership approaches by illustrating how knowledge mobilisation strategies are operationalised within the Australian Prevention Partnership Centre (the Centre), a national collaboration of academics, policy-makers and practitioners established to develop systems approaches for the prevention of lifestyle-related chronic diseases. We undertook interviews with key academics, policy, and practice partners and funding representatives at the mid-point of the Centre’s initial 5-year funding cycle. We aimed to explore how the Centre is functioning in practice, to develop a conceptual model of KMb within the Centre for use in further evaluation, and to identify ways of strengthening our approach to partnership research. Inductive and deductive thematic analysis was used to identify the key mechanisms underpinning the Centre’s KMb approach. Six key mechanisms appeared to facilitate KMb within our Centre, namely Engagement, Partnerships, Co-production, Capacity and Skills, Knowledge Integration, and Adaptive Learning and Improvement. We developed a conceptual model that articulated these mechanisms in relation to the structures and processes that support them, as well as the Centre’s goals. Findings also informed adaptations designed to strengthen the Centre. Findings provide insights into the practical realities of operationalising KMb strategies within a research partnership. Overall, the centre is perceived to be progressing towards its KMb goals, but challenges include stakeholders from different settings understanding each other’s contexts and working together effectively, and ensuring knowledge generated across different projects within the Centre is integrated into a more comprehensive understanding of chronic disease prevention policy and practice. Our conceptual model is now informing ongoing developmental evaluation activities within the Centre, where it is being tested and refined. The value of research for improving health outcomes and optimising the use of health system resources is well recognised [1, 2]. However, traditional research production paradigms are often poor at providing rapid and relevant research that has the capacity for clinical, public health and policy impact . For example, it is estimated that only 8–15% of research is applied in practice, with an estimated lag of up to 17 years between the development of research and its use [4–6]. Challenges to incorporating research in policy and practice are well documented and include decision-makers having insufficient time or capacity to read, interpret and apply evidence; the research not addressing relevant policy or practice questions or being insufficiently contextualised; lack of evidence availability when it is needed [7, 8]; cultural barriers between practitioners, policy-makers and researchers ; poor translation skills by researchers ; constraining organisational values, processes and incentives for KMb ; and wider challenges in the ever-changing political landscape [11, 12]. Cross-sectoral, multidisciplinary partnership research is one of the most effective means of facilitating research-informed policy and practice [4, 13, 14]. Research partnerships are especially helpful for addressing wicked problems where there are multiple interconnected causes, competing stakeholder interests and where the solutions are uncertain or unobtainable [14–16]. Underpinned by explicit KMb strategies, partnership research advocates a purposeful process of connecting academic researchers with decision-makers and practitioners with the goal of improving the relevance, quality and use of research in public policy and professional practice [17–20]. The inherent rationale of such approaches being that “the best and most lasting influences of research come about not when information is linearly transferred to the practitioner, but when teams of practitioners and researchers co-create knowledge by working together” . While research partnerships have been found to increase the uptake of research in policy and practice [15, 22–24], there is no ‘gold standard’ for how such partnerships should be constituted or what strategies they should employ to maximise effectiveness. Nevertheless, increasing empirical evidence points to characteristics that strengthen the connectivity and positive outcomes of research partnerships. Table 1 provides a synthesis of 12 critical characteristics of effective partnerships identified from four different approaches to investigating the functionality of collaborations. These approaches include a case study of a Collaboration for Leadership in Applied Health Research and Care (CLAHRC) , a longitudinal realist evaluation of three CLAHRCs that had varied success , a systems-orientated review of collaborative KMb models in healthcare , and an experientially derived field guide to managing research collaborations from the ‘science of team science’ field . As illustrated in Table 1, successful research partnerships for KMb appear to be underpinned by a number of structural and organisational features, including effective governance and support for the roles, processes and activities to be undertaken; influential and credible leadership to foster connections across the partnership; conflict management processes; and resourcing to support and reward partnership activity. Across these research partnerships, a range of mechanisms also appear to be important in enabling KMb, including building ownership and trust between stakeholders, establishing a shared vision and goals, strategic communications to facilitate connections and share knowledge, continuous learning, reflection and adaptation, and capacity-building. The Australian Prevention Partnership Centre (hereafter the ‘Prevention Centre’ or ‘Centre’)  was established in June 2013 as an Australian National Health and Medical Research Council (NHMRC) Partnership Centre for Better Health . Its goal is to identify systems, strategies and structures to inform better decisions about improving the prevention of lifestyle-related chronic disease in Australia. This goal reflects recognition internationally that chronic diseases are a serious and urgent population health problem  which, despite their complex aetiology, are largely preventable through efforts to influence lifestyle-related behaviours such as smoking, alcohol use, nutrition and physical activity . The Prevention Centre is a large partnership of researchers, policy-makers and practitioners. At the outset, it included 31 Chief Investigators, including 17 from academic research environments, 11 from practice and policy environments, and 3 working across both. At the time of writing, the collaboration has expanded to include over 150 individuals who are implementing 40 separate but interconnected research projects. The Prevention Centre had resources (dollars and in-kind) of A$22.6 million over 5 years provided by the NHMRC, Australia’s federal department of health, two state/territory departments of health and a national private health insurer. As outlined in Table 1, effective governance, supportive architecture, appropriate resourcing and influential leadership are recognised as crucial to successful KMb endeavours [25, 27, 33, 34]. Reflecting this, governance and leadership structures within and across the Prevention Centre are founded on three core elements, namely (1) a Governance Authority, comprising representatives from all funding partners who meet at least quarterly to review and approve research priorities and budgets; (2) a Leadership Executive, comprising policy-makers and academics who provide leadership and stewardship of the overall funding and performance of the centre; and (3) a Scientific Advisory Committee with international membership who function as an external reference group to advise on overall scientific direction. Operationally, the Prevention Centre functions across three groups where individuals may have multiple and changing roles. A Coordinating Centre manages the Centre business, including project initiation, funding and accountability, and delivers strategies to enable the partnership, including capacity-building, communications and engagement, integration of projects and learning, and Centre evaluation and improvement. Four Standing Capacities – small hubs of individuals with specific expertise in complex programme evaluation, communications, systems science, and implementation and evidence synthesis – provide input across the Centre and lead a number of research projects. Finally, the research is conceived of and implemented by interdisciplinary research project teams. The Prevention Centre’s initial work plan was founded on three broad ‘planks’, namely (1) partnership research as a vehicle for KMb, with a focus on co-production between academics, policy-makers and practitioners; (2) building knowledge and skills through formal and informal knowledge exchange and capacity-building activities that encourage reflective practice and creative responses to system improvement; and (3) actively designing and cultivating the use of research to impact at a systems level. To operationalise this approach, a range of strategies were used to foster connectivity across stakeholders, encourage co-production of research and build the capacity of members, with the ultimate goal of producing new knowledge and methods, and implementable policy-relevant advice that would influence decision-making in chronic disease prevention. In this paper, we seek to contribute to the growing discourse on partnership approaches to KMb by describing the operationalisation of the Prevention Centre [29, 34]. We use key stakeholder interviews to explore how the Centre is functioning in practice and to develop a conceptual model of KMb within the Prevention Centre. Our aim is to increase understanding of the realities of operationalising KMb strategies within a research partnership. We present this information together with reflections on some key challenges and strategies for tackling them. This study was undertaken as part of the Prevention Centre’s ongoing developmental evaluation . Here, our goal was to identify constructs that appeared to be essential to the operations of the Centre, and to develop a model that reflects the constructs and their relationship with each other. The purpose was to (1) highlight critical areas, including potential leverage points, so that those involved in running the Centre could focus their attention pragmatically for maximum benefit, and (2) use the model to design more rigorous evaluation strategies going forward. Consistent with systems thinking, we strove to investigate the messy realities of how the Centre was operating in practice (emergent patterns), rather than attempting to impose a pre-defined framework ; thus, we treated the information in Table 1 as sensitising concepts to be tested with stakeholders . Given the relatively exploratory nature of this investigation, and the need for a high-level strategic view of the Centre’s operations over the past few years (to be supplemented later with perspectives from other stakeholders), our chosen research method was in-depth interviews with the Centre’s Chief Investigators at the mid-point of the Centre’s first 5-year funding cycle. All 31 Chief Investigators listed on the original funding proposal were invited to participate in semi-structured interviews; 26 (84%) agreed to participate (Table 2). Many of the academics had previously worked (or still had roles) in health service delivery or policy agencies, and some of the funding representatives and policy/practice partners also held adjunct positions in universities. All had management or executive roles in their organisations and, as Chief Investigators, were leading programmes of research and/or contributing to strategic decision-making in the Prevention Centre. Interviews (n = 26) were conducted between January and March 2016. They took place by telephone (n = 20) or face-to-face (n = 6) depending on stakeholder location and preference. Interviews were audio-recorded and transcribed verbatim. The average length was 42 min (24–76 min). Open-ended interview questions were based on existing frameworks that had guided the establishment of the Prevention Centre and its approach to evaluation. This established some a priori concepts, including those identified in Table 1, plus dimensions of research contribution identified in the Payback Framework , the breadth of research outputs listed in the United Kingdom Research Excellence Framework , forms of research capacity and influence described in the Canadian Academy of Health Sciences Framework , and applied categories of influence developed for the Research Impact Framework . The interviews explored stakeholders’ expectations of their involvement in the Prevention Centre and their perceptions about what aspects of the partnership were working well or needed improvement, how the partnership developed and how it functions in relation to the concepts above, if/how co-production was occurring in action, and the degree to which the Centre was producing new knowledge, methods and implementable policy-relevant advice, and influencing decision-making. The interviews were conducted conversationally to allow interviewees to raise issues and explore new ideas. Interviewees were asked to critique core hypotheses about what mechanisms were operating, provide concrete examples from their own experience about how the partnership was working (or not), and were encouraged to provide frank feedback. They were prompted to critique the language used (e.g. ‘co-production’ may be perceived quite differently) and to identify key concepts, challenges and areas for improvement. A thematic data analysis approach was used in which patterns and themes within and across interviews were identified . As is usual in the process of constant comparison, analysis was performed in parallel with data collection so that emerging ideas could be explored in further interviews . During this phase of data analysis, two researchers (SR and KG) read the transcripts and developed initial codes across the available dataset. These codes were then reviewed and considered in relation to the key concepts underpinning the Prevention Centre’s initial approach to KMb (co-production, partnerships, and capacity and skills) and intended outcomes (new knowledge and methods, policy-relevant advice and influencing decision-making), and amended in response to further data. This combination of inductive and deductive analysis allowed us to explore novel concepts related to the functioning of the Prevention Centre, and to critique and refine the a priori KMb concepts we had identified. Revised codes were applied to the whole dataset and emerging results were also discussed with members of the wider research team (SW, AW, MO and JS), who had operational roles in the Centre. Draft findings were presented and discussed at a number of Centre events where interviewees were in attendance, and the authorship team (all but one of whom were also members of the partnership) engaged in iterative discussion over several drafts of this paper, all of which helped to refine the results for accuracy and trustworthiness. Table 3 in the appendix describes other aspects of the study design and conduct according to the consolidated criteria for reporting qualitative research (COREQ) checklist . We identified six key mechanisms that appear to be crucial to the functioning and potential success of the Prevention Centre as a KMb endeavour, namely Engagement, Partnerships, Co-production, Capacity and Skills, Knowledge Integration, and Adaptive Learning and Improvement (Fig. 1). While the extent to which these mechanisms were being operationalised within the Centre varied, with more work needed in some areas, they were all considered to be essential for reaching our goals. In the following sections we present results in relation to each of these mechanisms, including their role in KMb, and stakeholder reflections on key challenges and achievements to date. We include illustrative comments from stakeholders, labelled to indicate the participant number (e.g. P01) and the interviewee’s connection to the Centre (i.e. Policy or Practice Partner, Funding Representative, or Academic). The Prevention Centre is made up of a large and diverse network of stakeholders working in a variety of settings (academia, policy, practice and industry) and geographically dispersed across Australia. For many interviewees, the Prevention Centre network was valued as providing a ‘critical mass’ in chronic disease prevention by connecting people who are otherwise separated by institutions, disciplines and geography. Interviewees recognised that this wider group of stakeholders must have a voice in Centre decision-making and scope to actively participate in its work if they are to remain engaged and make valuable contributions. Engagement was conceptualised as committing time and resources to the work of the Centre, participating in its activities (including undertaking research projects and attending meetings and events), feeling connected with the Centre both in terms of knowing what is happening (e.g. research projects, people, progress) and having a sense of ‘identity’ as a Prevention Centre member, and sharing a common vision for the Centre and its overarching aims. Those who felt they had a clearly defined role, or had received Centre funding for a specific project, tended to feel more engaged. Conversely, those who saw their involvement as more limited often reported a lack of projects that aligned with their expertise, or uncertainty about how they could be involved. Communications, such as regular centre newsletters, had reportedly enabled many new members in policy and practice settings to find out about projects. Interviewees argued that compelling strategies to maintain the involvement of “talented people” were necessary because of their competing priorities and busy workloads. Cross-sector partnership research was regarded as critical for developing policy- and practice-relevant research. The Prevention Centre was perceived to be doing well in this regard. Interviewees valued the Centre’s approach to building partnerships that spanned personal and professional relationships between individual researchers, policy partners and practitioners, as well as relationships between the Prevention Centre as an entity and other organisations (including universities, government agencies and private companies). Existing relationships that pre-dated the Prevention Centre were considered crucial in establishing the Centre’s networks. Face-to-face events helped strengthen these relationships and forge new ones, especially when they allowed for informal discussion and connections, but some had difficulties attending such events due to lengthy travel times and other commitments. Facilitators of co-production in the Centre described by interviewees included access to a network of collaboratively orientated academics and policy-makers working in prevention, and formal requirements such as the need to specify policy/practice partnerships in research proposals and an approvals process in which research proposals were vetted by funding partners. The Prevention Centre strives to build the capacity of individuals, groups and organisations to produce and use prevention research via targeted capacity-building activities and through engaging in collaborative research that facilities mutual learning across individuals and contexts. The Prevention Centre’s programme of work is large and ambitious, with 40 projects spanning a range of areas relevant to chronic disease prevention, including urban planning, food systems, alcohol and public health law, as well as implementation, scale up and evaluation. Two strategies were suggested for combatting the problem of siloed projects. First, a steering group with responsibility for working across the Centre to identify how the outputs of each project could contribute to a larger story in prevention, and convening theme groupings of researchers working in related areas. Second, to achieve this ‘bigger picture’ there needed to be a clearer overarching purpose towards which everyone in the Centre was working. Given the complex, organic and dynamic nature of the Centre, which consists of many actors and components engaged in multiple projects and activities embedded within and across existing research, policy and practice systems, adaptive learning and improvement is crucial for enabling the Centre to develop productively. This involves cycles of reflection on the practice of partnership, feedback and evaluation, and responsive change. Another observed that project management within the centre had evolved to better engage academics, in particular by taking a more hands-off approach that enabled them to develop and lead projects. We used the data outlined above to critique and broaden the three broad ‘planks’ that had underpinned the Centre’s initial work plan. The result was a refined conceptual model of how the Prevention Centre operates as a KMb endeavour. This model, illustrated in Fig. 1, maintains the key elements of the original ‘three planks’ but teases apart the concepts to reveal a more delineated model. It distinguishes between (1) the ‘inputs’ of the Centre (the six interconnected cogs in the middle of the figure), which are the governance and organisational structures that underpin the Centre and enact its strategies (as described earlier); (2) the ‘KMb mechanisms’, described above, that drive the Centre’s productivity (the inner circle); and (3) the Centre’s ‘intermediate impacts’ (the outer circle of the model), which is how we expect knowledge to be used as a result of the inputs and proximal impacts. The more distal impacts, for example, increased health promoting behaviours, socioeconomic benefits and improved health outcomes, are intentionally omitted in the model consistent with the understanding that the outcomes of research may take some time to manifest . The model reflects the dynamic nature of our work and the interaction between elements of the partnership such that effects feed both inwards and outwards. The dashed circle encapsulating the framework represents a permeable boundary, recognising the Centre interacts with, influences and is influenced by many factors, including political, policy, health service and university systems. This paper explores how The Australian Prevention Partnership Centre, a research partnership for chronic disease prevention, has operationalised its approach to KMb. Through interviews with 26 of the Centre’s Chief Investigators, we identified six mechanisms that appear to facilitate KMb within our Centre, namely Engagement, Partnerships, Co-production, Capacity and Skills, Knowledge Integration, and Adaptive Learning and Improvement. Interviewees were supportive of the KMb strategies being enacted and believe they are helping the Centre progress towards its goals. A number of challenges were identified, particularly in terms of researchers, policy-makers and practitioners understanding each other’s contexts, maximising policy contributions, and ensuring that knowledge gained from projects and players across the Centre is integrated to provide a ‘bigger picture’ in chronic disease prevention. At the time of undertaking the interviews, it was too early to identify how the Centre was performing in terms of its desired impacts, but early indications were positive, with many noting that the Centre was on its way to influencing policy and practice decision-making. Through interviews with key stakeholders at the mid-point of the 5-year funding cycle, and drawing on our engagement with the literature, we critiqued and broadened our early conceptual model to develop a refined understanding of how the Prevention Centre operates as a KMb endeavour. This model recognises that the creation and use of research for complex problems like chronic disease is optimised when diverse members share goals and contribute to and identify as part of the partnership (Engagement) [23, 33, 49]; strong networks are built across disciplines, organisations and geography (Partnerships) [15, 24, 33]; opportunities for researchers, policy-makers and practitioners to work collaboratively and share decision-making are created and supported (Co-production) [25, 46, 47]; and there is capability development for members to engage with cross-sector partners and to work in new and creative ways (Capacity and skills) [27, 28]. The KMb model also highlights the need for processes that draw together different kinds of knowledge generated across the Centre so that it achieves more than the sum of its parts (Knowledge integration) . Finally, our model highlights the value of engaging in continuous reflection and adaptive learning to ensure the Centre’s operations and research outputs are fit-for-purpose in this complex and dynamic environment (Adaptive leaning and improvement) [23, 51, 52]. The KMb mechanisms identified within our conceptual model are supported by the organisational and governance structures of the Prevention Centre. In addition to refining our conceptual model of KMb, the findings from these key informant interviews have provided opportunities for reflection and action to strengthen strategies for facilitating KMb. For example, on the basis of the broader findings, the Prevention Centre has taken steps to better tailor communication of evidence to the needs of policy-makers, including the development of concise and accessible ‘Findings Briefs’ that summarise key findings from completed projects. To strengthen knowledge integration, we have also established a number of theme groups that bring together project teams whose work falls within a similar area to discuss possible synergies and identify how their individual project findings can contribute to a more integrated ‘bigger picture’. Articulating our model of KMb was challenging due to the multifaceted and dynamic nature of KMb and the complexity of the Prevention Centre itself, but it was worthwhile, particularly because the model is now guiding further developmental evaluation strategies . For example, constructs in the model underpin our regular partnership surveys and have been used in evaluation interviews with researchers, policy-makers and practitioners. These interviews are also being used to ‘test’ the constructs and their relationship to each other, enabling us to refine the model so that it better reflects stakeholders’ experience of practice realities . We note, however, that partnerships evolve over time and that different mechanisms and strategies may be more important in different phases . Our model was developed to describe the Australian Prevention Partnership Centre’s operationality. As such, it reflects the Centre’s particular goals and context, including partners, organisational needs, funding requirements, and state and national infrastructures. Nevertheless, we suspect that it is broadly applicable to other partnerships, partly because our mechanisms align with other descriptions of success factors in KMb and collaboration. For example, a recent report, which combined two reviews of reviews examining the effectiveness of interventions to increase the use of research in decision-making, identified six mechanisms through which research-informed policy and practice might be achieved. These were (1) building awareness for, and positive attitudes towards using research; (2) building agreement on policy-relevant questions and fit-for-purpose research; (3) communicating and providing access to research; (4) facilitating interactions between decision-makers and researchers; (5) developing skills to access and make sense of research; and (6) influencing decision-making structures and processes . These are largely consistent with our findings. 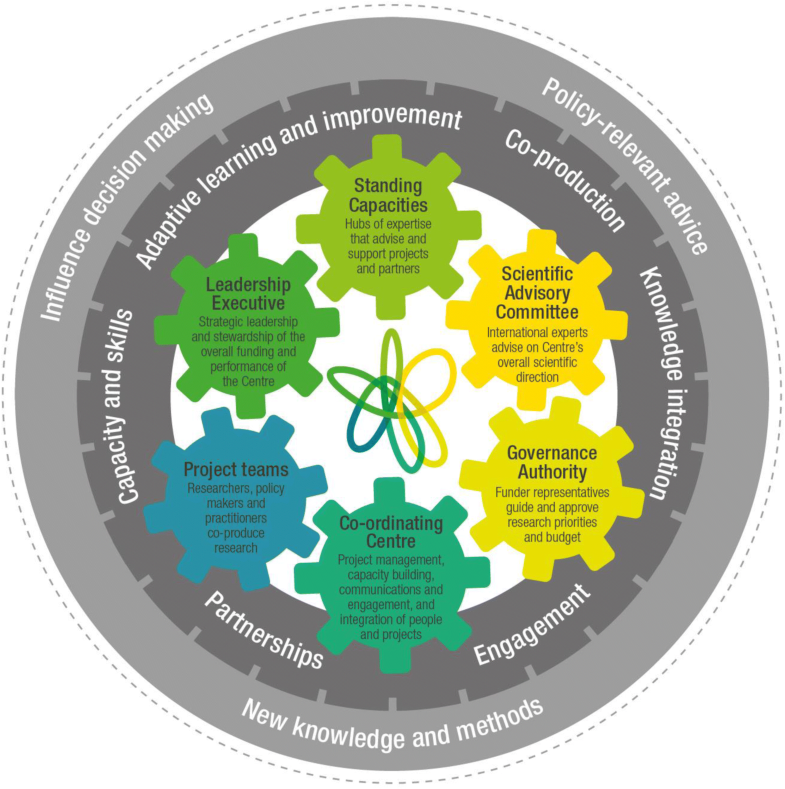 The ‘cogs’ that depict the Centre’s governance and organisational structures in our model are probably specific to our project, but some forms of governance and day-to-day management will likely be essential in any partnership [22, 55, 56]. The Australian Prevention Partnership Centre is a large, national research–policy–practice collaboration with a remit to develop information, tools and actions needed for effective systems-level prevention of lifestyle-related chronic disease. Work undertaken as part of our evaluation enabled us to articulate our approach to KMb in the form of a conceptual model which is now being used to inform a mixed-methods evaluation framework that is exploring not only what we have achieved, but how, i.e. the processes that contribute to (or hinder) the advancement of our goals. This evaluation forms an integral part of our engagement in adaptive learning and improvement and, we hope, will also contribute to the value, functionality and operationalisation of other research partnerships. We would like to thank the chief investigators and funding partners for contributing their time to participate in interviews as part of the ongoing evaluation and improvement of the Prevention Centre. We would also like to thank Kim Gordon (KG) for her initial creative ideas in relation to the Centre and its model of KMb as well as her analysis of the key informant interviews, Emma Slaytor for her support in interpreting the data, and Julie Coughlan for producing the image of our model. Finally, thanks to members of the Prevention Centre, particularly the Coordinating Centre and Leadership Executive, for their input and support during the development and evolution of the Prevention Centre programme model and evaluation. The work was funded by the National Health and Medical Research Council of Australia (NHMRC) through its Partnership Centre grant scheme (grant GNT9100001). NSW Health, ACT Health, the Australian Government Department of Health, the Hospitals Contribution Fund of Australia and the HCF Research Foundation have contributed funds to support this work as part of the NHMRC Partnership Centre grant scheme. The contents of this paper are solely the responsibility of the individual authors and do not reflect the views of the NHMRC or funding partners. The data that support the findings of this study are available on request from the corresponding author (SR). The data are not publicly available due to it containing information that could compromise research participant privacy and consent. We dedicate this work to our colleague, mentor and, above-all, friend, Associate Professor Sonia Wutzke (1970–2017). The public health community is richer for having had you as one of its most passionate advocates. SW conceived of the idea for this project and supervised data collection and analysis. SJR led the collection and analysis of the stakeholder interview data. AH undertook a review of knowledge mobilisation partnerships and developed the table presenting key characteristics of these partnerships. SW, SJR, SD, MO and JS developed the conceptual model presented in the paper, and PH, PK, SR, AH and AW provided critical feedback and refinement of the model. SW and SJR led the initial drafting of the manuscript, AH led redrafts. All authors read and approved the final manuscript. Ethical approval for the interviews was obtained from the Sax Institute low-risk research assessment committee (ref: R2015/12/07) and all participants provided verbal consent to participate and be audio-recorded. To protect stakeholder identity and relationships, all data were de-identified prior to discussion within the research team. Cairney P, Oliver K. If Scientists Want to Influence Policymaking, They Need to Understand it. In: The Guardian Guardian Media Group; 2016. https://www.theguardian.com/science/political-science/2016/apr/27/if-scientists-want-to-influence-policymaking-they-need-to-understand-it. Accessed 9 Jan 2018. Phipps D. What is Knowledge Mobilisation and Why Does it Matter to Universities? The Guardian; 2012. https://www.theguardian.com/higher-education-network/blog/2012/mar/09/introduction-to-knowledge-mobilisation. Accessed 22 Dec 2017.